Technical Car Experts Answers everything you need: Ice maker is making ice but not dispensing ice? Ice maker is making ice but not dispensing ice? 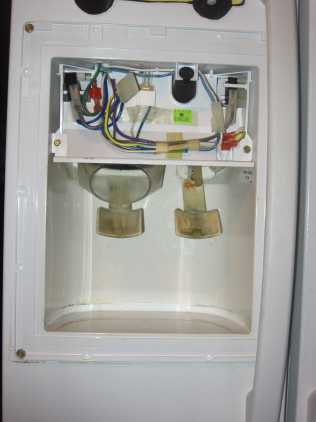 The dispenser panel/facade can be removed by inserting a flat blade screwdriver into the two slots on the bottom side (edge) of the dispenser panel(facade) and twisting the blade until the panel snaps free at the bottom, slowly and carefully push up on the panel until the hidden retaining tabs are free from the dispenser body. Label the wires and disconnect the harnesses/and wires as needed, and set the panel aside. Remove the (3)screws holding the switch bracket assembly to the housing assembly. You will then have access the the switches, wires, and paddle assembly. First, take the ice bin out of the refrigerator. Now set dispenser control to cube ice, open the freezer door, depress door switch and push the switch to get ice. What you should see when everything is working properly is the auger motor (the fork sticking from behind where the ice bin was) will turn and the solenoid (the device just to the right of the motor) should jump up. If the solenoid jumps up but the motor doesn’t turn, the motor is frozen. This happens when too much moisture gets in the freezer. Now to repair this you take the motor out, you should be able to take the whole housing out, including the solenoid. Once it’s out, dry the motor out with a hair dryer until it turns free. If you cant get it to turn free, replace it. After you reinstall it, you need to try to find out what caused it to freeze. The door gasket or the ice shoot can be bad and cause the auger motor to freeze up, if so, most of the time ice will build up around them if they are. If you have a GE with serial number starting with AA2-DZ2 then the freezer and fresh food doors need to be replaced. Up until March 2008 GE was replacing them free of charge. If when you do the test the motor turns and the solenoid doesn’t jump up (make sure you have the controls set to cube and not crushed) replace the solenoid. If when you do this test the motor and the solenoid work as I described, then the problem is in the ice bin or the ice shoot. First look at the ice bin to see if there is a lot of ice keeping it from working, if so, clean it out with hot water If there is no ice you should check to see if the auger is broke, if so, replace. You should check the to see if the ice separator (the divider between the ice storage and the ice dispenser) has a hole in it, if so, replace it. Those are the most common problems with ice bins. If you didn’t find those two parts broken replace the whole ice bin if it is available. These parts can be found at AppliancePartsPros.com. . If ice cubes hang in the ice chute then the flapper may not be opening. To check this, first you need to open the door and take the ice bin out then depress the door switch while at the same time press the switch to get ice. If it opens and closes but not all the way, look to see if anything is blocking it. If not, it’s the flap, the spring, the crank, or the solenoid (the device that opens the flap). Now you need to remove the front cover off the dispenser (on most refrigerators it just snaps off). 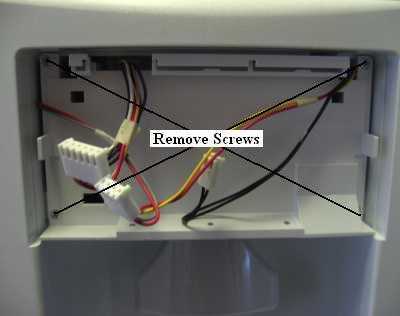 Then remove four screws behind the cover and remove the dispenser control. Once off you should see the flap. Inspect the spring to see if it is broke or out of place, if so, replace it. Then see if the crank (the part that the flap is attached to) is broke, if so, replace it. Now look at the flap to see if the edges are rolled over or is broken, if so, replace it. Now for the solenoid, sometimes it gets rusty and won’t close all the way. Sometimes it overheats and welds itself open, if this happens it won’t open or close. In any case, if it doesn’t open or close properly replace it. This part can be found at AppliancePartsPros.com. 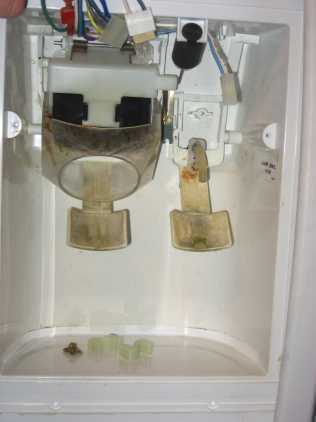 If your solenoid is rusty and you have a GE refrigerator with serial number starting with AA2 through DZ2, the doors on the refrigerator (fresh food doors and freezer doors) need to be replaced. Up until March 2008, GE was replacing the doors free of charge. 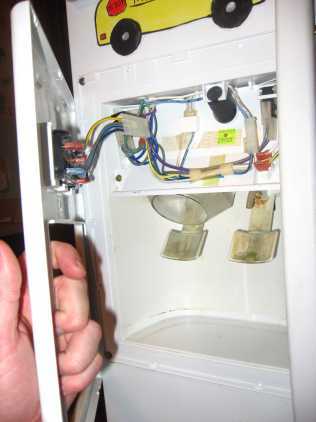 Once the dispenser board is off remove the four screws that hold the housing on. Then you should be able to access the flap and the solenoid. 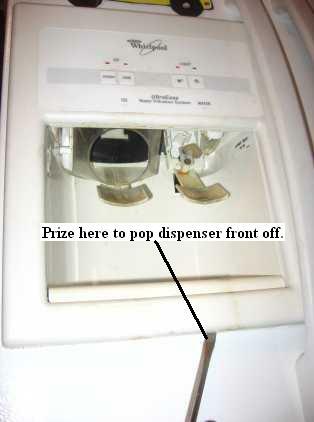 First disconnect power to refrigerator then prize the dispenser panel off by inserting a screwdriver into the bottom and gently prizing it until it pops loose. Sometimes it is necessary to prize a little near the top but if possible do all the prizing from the bottom. Now remove the screws that hold the housing on and remove the housing. If you didn’t hear a noise when you push the button to get ice, the problem is electrical. The dispenser board is the most likely problem but it can be hard to check, so you need to eliminate everything else first. If the flap opens when you push the button to get ice but none of the other mechanical parts move it can be a loose connection at the door hinge or in the auger motor housing. 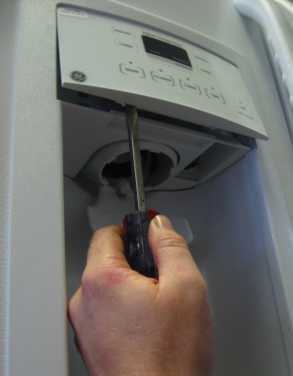 First, take the cover off the freezer hinge and make sure the wires are plugged in good. Now check to see if your problem is fixed. If not take the auger housing (the housing that holds the auger motor in place behind the ice bin) and check to see if the all the plugs are in good. If all the connections are good, replace the dispenser board. If the flap doesn’t move when you press the switch to get ice, then it may be the micro switch. Take the cover off the front of the dispenser then remove the dispenser control. Now you should be able to see the switch unplug refrigerator and remove wires from switch. Using your meter , check the switch and you should have continuity between the terminals that are marked C and NC when you depress the switch. 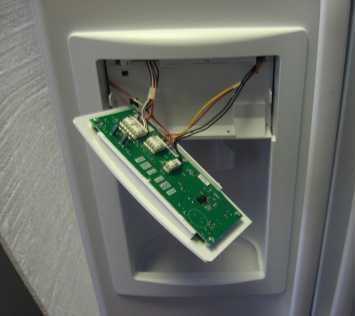 If you don’t have continuity, replace the switch and if you do, replace the dispenser board. Dispenser boards can be found at AppliancePartsPros.com. If you have a GE refrigerator made after the year 2000 and you don’t hear anything when you press the switch to get ice the problem is most likely the main board (the main board is located behind the refrigerator). 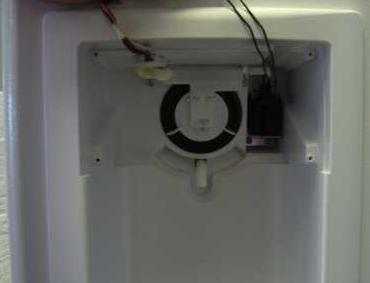 If this is your problem when you press the switch the refrigerator will cut off, (everything compressor, fans and all). If this happens, replace the main board. GE refrigerator main boards can be found atAppliancePartsPros.com. Labels: Ice maker is making ice but not dispensing ice.